Your silver Roosevelt dime values are tied directly to the current price of silver. With silver at $14.90 per ounce, that puts the value of the coins minted from 1946 to 1964 at $1.12 each. Minted and saved in the millions, today only "Uncirculated" coins are widely collected. These are described as bright, like new, no wear and virtually mark free. Anything less and they trade at the silver value. Pictured is an example of a very nice uncirculated Roosevelt dime, value $1.20 to $1.35 . Even though this example is a very choice coin, the premium above its silver value is small. There is a lot of room for upside potential in the future as the collector base grows. There are a few exceptions where circulated or worn coins have premium values, mostly found in the early years, see the value chart below. The following coin values chart indicates the series is still in the early stages of its value development. Examine your coins closely and grade conservatively. They need time to mature in value. The above are wholesale Roosevelt dime values. Computed from dealer's price lists with various mark-up factors figured in. They reflect closely the value you would expect to receive when selling. It is the collector that ultimately determines silver Roosevelt dime values. And today most collectors want "Uncirculated" coins in their collections. These coins are readily available, affordable and none of the dates are rare. The result, even in Uncirculated condition most are valued only slightly above their silver value. How to Grade Your Roosevelt Dimes: Inspect your coins closely, looking for any signs of wear on its surface. As a coin circulates through commerce and wears, the different stages are assigned a "Grade." 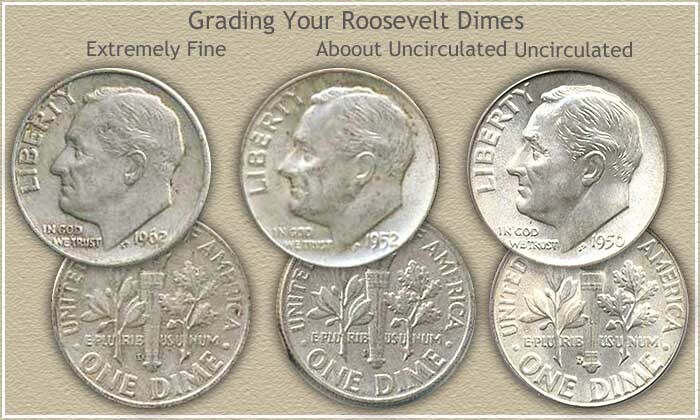 The "Grading" image below shows the important stages affecting silver Roosevelt dime values. The "Extremely Fine" grade is a circulated coin with obvious signs of wear. The "About Uncirculated" coin has just a slight amount of wear. Is your coin Uncirculated? It must not have any trace of wear, look at the cheek bone and hair above the ear. On the reverse check the flame of the torch. Luster must remain over the entire coin. Now, the fewer marks and abrasions the better. In the Uncirculated grade, it takes great eye appeal to draw the attention of a collector and attain a higher value. See the video: Grading Roosevelt Dimes and follow the process of judging condition and confidently separate the bullion value coins from the premium collector pieces. 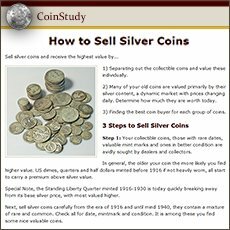 Check a few coin dealer's listings, look for those offering similar coins as yours for sale. Their descriptions indicate what is important to value. Additionally, these coin dealers are potential buyers of your coins. 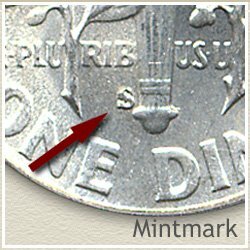 Finding the Mintmark on your Silver Roosevelt dime often discovers a coin worth slightly more. The different mints placed them on each coin to indicate their origin. The Denver mint used a "D", the San Francisco mint an "S" and the Philadelphia mint did not place a mark on the silver issues of Roosevelt dimes. Consider your group of coins as the beginning of a coin collection. Silver Roosevelt dime are an affordable entry. The start of an enjoyable and rewarding hobby. If that is not for you, one successful approach is to sell all your coins and use the proceeds to buy one nice rare coin. The one you were hoping to find in the box. Pass the thrill of a rare coin on to your children. The fact so many of these coins are available to collectors holds rising value in check. The vast majority of silver Roosevelt dimes have their fortunes tied to the value of silver. Continuing and developing interest are ahead. Check back occasionally to stay current with developments. Silver Roosevelt dime values are bound to change. 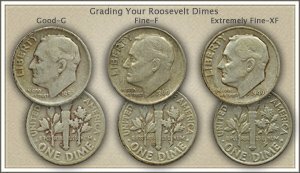 Your primary consideration in grading Roosevelt dimes is the confidence of separating the bullion silver dime pieces from the higher value collectable ones. 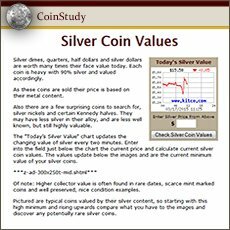 Dime Values listed for Bust, Liberty Seated, Barber and Mercury Dimes. Match your coins to the Grading Images to judge condition and coin value charts. Print the Coin Values Worksheet to list Roosevelt dime values. Should you decide to sell... use the worksheet as an invoice and packing slip when sending coins through the mail to dealers. It indicates you have done your coin values homework.